The leading men and women of film are generally extremely good-looking, with their characters boasting exceptional skills in one or more fields (usually ‘guns’, ‘saying cool things under pressure’ and ‘driving really fast without crashing’). Some film heroes, however, are almost entirely unsuited to the terrifying tasks set before them. Here are some of our favourite unlikely film heroes. Shaun works at an appliances shop, thinks a night down the local is a romantic date and lives with his best mate, who spends most of his days smoking and playing Timesplitters. He’s one of us, basically. In any other zombie movie, Shaun and Ed would serve as comic relief before either a) getting eaten or b) toughening up and heroically sacrificing themselves. It’s not hard to imagine Rick Grimes shouting at them for being a bit useless on an episode of The Walking Dead. In Shaun of the Dead, though, Shaun is the hero. And he’s probably the most realistic zombie movie hero ever too: instead of becoming an intense killing machine, he goes to save his mum, runs to the pub to ‘wait for things to blow over’ and uses the whole thing as an excuse to get his ex-girlfriend back. Like we said: one of us. Get Shaun of the Dead in our amazing Buy One, Get One FREE offer! M Gustave is the concierge of the fancy Grand Budapest Hotel and a frequent romancer of older women, dedicating his life to their…ahem, service. When one of them passes away and Gustave is left with a sizeable inheritance, however, he is forced to adopt a slightly tougher stance – especially as her spurned children are pretty much psychopaths. Gustave ends up taking part in gunfights and high speed chases, both well beyond the remit of your average concierge. Fortunately, he has his own Justice League of concierges to rely on. Get The Grand Budapest Hotel in our awesome 2 for £3 offer! Jeff ‘The Dude’ Lebowski is a chill guy. 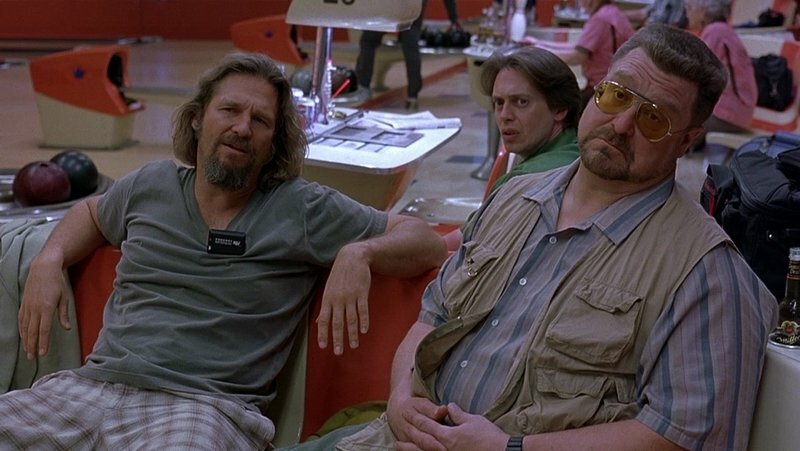 So chill, in fact, that the character has inspired his own religion, in which the faithful seek enlightenment through bowling, White Russians and generally taking things easy. The problem is, being chill doesn’t necessarily help when you’re trying to save a kidnapped girl and angry nihilists are ruining your favourite rug. Luckily, the Dude has the volatile Walter by his side. Together, they make a surprisingly effective pair of private detectives – and an even better bowling team. Alright, so Anakin Skywalker has really high midichlorian levels or whatever but the chances of Qui-Gon Jinn of finding him in the first place were super slim. First, Qui-Gon crash landed on Tatooine. Then, he ran into Anakin, a slave boy. And, finally, Anakin won a race to win his freedom. Get Star Wars Episode I: The Phantom Menace in our 2 for £5 offer – there are loads of other movies to choose from too! If we were sat at home and Joe Pesci burst in, we’d cower behind the sofa and tell him to take whatever he wants (apart from the shine box because we know he doesn’t like that). Little Kevin McAllister, who has already been abandoned by his parents, responds by building an elaborate set of traps that would have almost certainly killed both Wet Bandits countless times over. It’s no wonder some people think he grew up to become Jigsaw from Saw! Get the entire Home Alone collection in our 2 for £5 offer! But really, it’s far more likely Brucie and Tone would spend their megabucks on yachts and golden toilet seats than risking their lives fighting men dressed as clowns (although we could do with some help on the front at the moment, if any millionaires are reading…). Get Batman in our 2 for £5 offer, Batman Begins in our Buy One, Get One FREE offer and Iron Man 3 in our 3 for £10 offer! Who is your favourite unlikely movie hero? Let us know in the comments. Don’t forget to check out our amazing DVD & Blu-Ray offers on the musicMagpie Store, where you’ll find hundreds of brilliant films of all genres! ← Magpie DVD Club: The Angry Birds Movie, The Boss and more!